Home / FAQ / What is Medicare health insurance? Funded and sponsored by the United States government, Medicare health insurance is designed for individuals who are age 65 or higher, or younger than 65, but with certain disabilities. Medicare is also available for anyone who has been diagnosed with kidney failure that requires daily dialysis. Even if you are eligible for Medicare, you can still compare health insurance rates online. Just enter your zip code in the box above to get started. What is Medicare Part A and how can I benefit from the coverage options? Medicare Part A usually does not have any costs associated with it, since most people who have worked all of their lives have contributed through payroll taxes. However, if you are not eligible for Medicare Part A free, you can purchase it with Medicare Part B. How does Medicare Part B work and what is the available coverage? Medicare Part B also covers the cost of any supplies and care relating to the use of those supplies. For example, if you are diabetic, Medicare Part B will cover the costs associated with the treatment of your condition, as well as the cost of any health care professional that helps care for you. Medicare Part B is different from Part A in that you must pay a premium each month to be covered by Part B. In addition, Part B covers preventative care such as flu vaccines. Is Medicare Part C different from Part A and Part B? Medicare Part C is also known as the Medicare Advantage Plan and it acts as a health insurance plan similar to one you may have had when you were working full time. Medicare Advantage is provided by private insurance companies that have been pre-approved by Medicare, and not by the United States government. Each is screened and must follow a strict set of rules in order to provide coverage to people with Medicare. Depending on the private insurance company that is offering the coverage, you may also receive dental and vision coverage through a Medicare Advantage program. How much does a Medicare Advantage program cost each month? The answer to this question depends on the private insurance company providing the coverage, but it is important for you to learn as much as possible about the different options available to you. Be sure to ask about monthly premiums, whether the premiums cover any other portion of your Medicare coverage, if there is a deductible you need to reach before coverage kicks in, if there is an annual limit on coverage and how much visits will cost. All of these answers will most likely vary by provider so be sure to take the time to learn as much as you can. There are also not-for-profit organizations that can assist you with making a choice or you can simply visit Medicare’s website. Can I get prescription medicine coverage with Medicare? 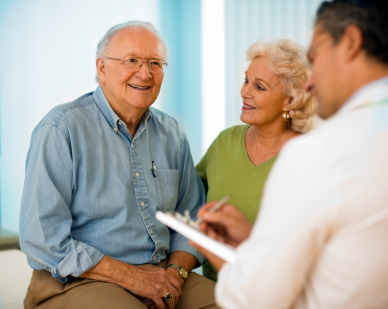 The final option with Medicare is Part D, which is also known as prescription drug coverage. This coverage is only available to you if you are enrolled in one of the other Medicare programs, including Medicare Advantage. However, there are some time restrictions when it comes to signing up for Medicare Part D. First, you can only register for coverage between October 15 and December 7 of any given year in order to have your coverage begin on the following January 1. There are several different ways to sign up for a Medicare prescription drug plan once you have made your choice as to which plan to use. These include over the phone, online, or through an application by mail. It is important to remember that if you have prescription drug coverage through your Medicare Advantage program and sign up for Medicare Part D, you will be automatically deregistered from the Advantage plan and put back into regular Medicare. Still looking for competitive health insurance rates? Put your zip code in the box below! Do I need supplemental health insurance for Medicare? What is health insurance about?